The ItemsPanel property of a ListBox specifies the template that defines the panel used to contain the elements of the ListBox. You can override the normal vertically stacked layout of a ListBox by defining your own template. 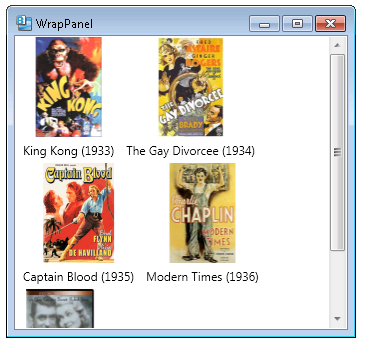 If you set the ItemsPanel template to contain a WrapPanel, the ListBox will show its child elements left to right, wrapping to the next row when each row fills up. In the example below, we bind a ListBox to a list of movies, specify an ItemTemplate that dictates how each item appears, and then specify a template for the ItemsPanel that contains a WrapPanel. Notice that the layout changes as we resize the parent window. 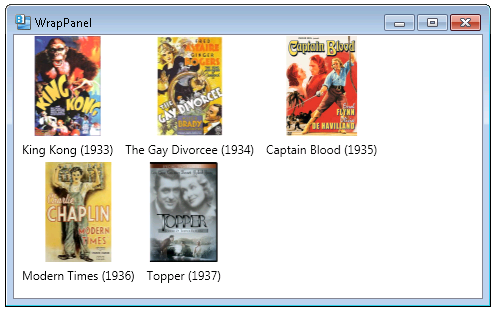 Hey man nice, i am a beginner and i just learn to do this, but i have a question, if i wanna justify the items, in the right side of the movie list is a blank space, how can i remove it?. You might also look at this article – http://www.codeproject.com/Articles/32629/A-better-panel-for-data-binding-to-a-WrapPanel-in , which talks about creating a WrapPanel that has items with uniform width.